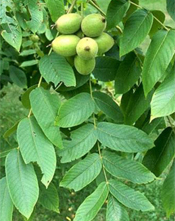 Found mostly on the Butternut (Juglans cinerea) but other members of the walnut family may also be affected. All naturally occurring Butternut trees of any age and size are protected in Ontario whether or not they are infected with Butternut Canker, but some infected trees may qualify for exemption. The fungus usually kills trees quickly. Diseased areas called cankers develop under the bark and eventually surround the branches and main stem. 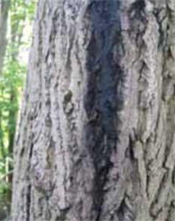 The cankers restrict the flow of water and nutrients and “strangle” the tree. Identifying features include; dying or leafless branches in the crown; dark, sunken, elongated cankers on the branches and stems, often with a dark, sooty patch of bark; black fluid oozing from the cracks in the bark during the spring or a sooty stain from dried fluid during the remaining seasons; epicormic branches growing from the trunk below the dead or infected areas; loose or missing bark over older cankers. 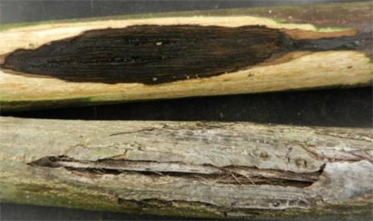 In the spring and early summer, cracks in the bark of the branches and main stem can leak a blackish fluid which is a characteristic sign of the infection beginning. Infection usually occurs in the lower crown of the tree first and then spreads downward as fungal spores are washed by rain along the branches and down the main stem. Fungal spores can be spread by splashing raindrops, by insects and birds and by infected seeds, making the fungus hard to control. In the summer, a whitish margin sometimes forms around the sooty black cankers. When the bark has been peeled from a cankered branch or twig and if the cambium layer is dark brown or black in colour, it is dead. Learn how to properly identify the Butternut tree and symptoms of Butternut Canker. Help protect the Butternut trees and report locations of Butternuts to the MNR. Promote healthy and vigorous growth and seed production. Increase the amount of sunlight available to them by removing some of the competing species around them. High value trees that are severely infected can be conserved by pruning the affected branches and excising trunk cankers. Take advantage of genetically resistant trees and plant more Butternut trees to maintain the species.